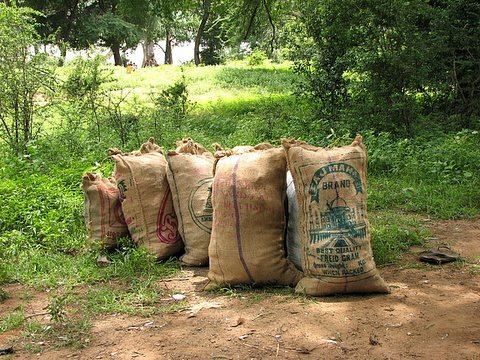 Whenever we go out into the forest areas surrounding Bengaluru, especially around the Kaveri banks, we see Nature’s beauty spoilt by the unthinking trippers who leave so much of trash behind them, unmindful of what it is doing to the environment. Most of us delicately pick our way through the waste, complain bitterly,and come back resolving not to go to that particular spot again. But not all of us do that. Some are concerned enough about the damage to the surroundings to do something about it. Some people form NGO’s and try to approach the problem from different angles.And some people, like Clean and Green, just band together as a group of volunteers, and decide that they will just clean up as much plastic as they can, when they can. 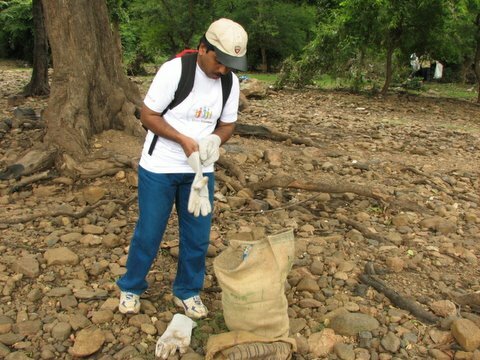 Clean and Green is just a band of volunteers, says Sandeep Chakraborti, who conceived of this idea some time ago, in the course of the angling/trekking/camping trips he organizes with his organization, Outrigor. Along with Roopa Shankaran, they have been getting together small bands of volunteers to pick up plastic trash at various places, like Sangama, Muthathi, etc. Jungle Lodges and Resorts has been very supportive of this initiative in terms of providing a place for the volunteers to rest after their labours, and provides a simple lunch to the volunteers. But this time, Clean and Green’s hands were strengthened by Oracle, the software giant. 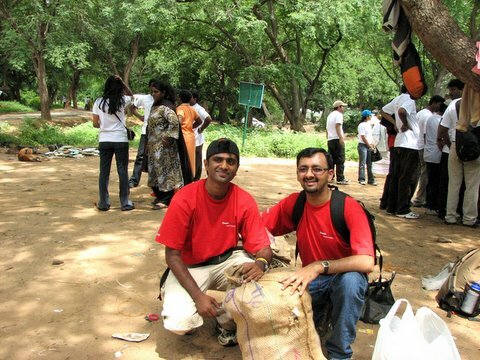 Oracle has the Global Volunteer Days initiative across the world every year, as part of their commitment to contribute something to the upkeep of the environment. 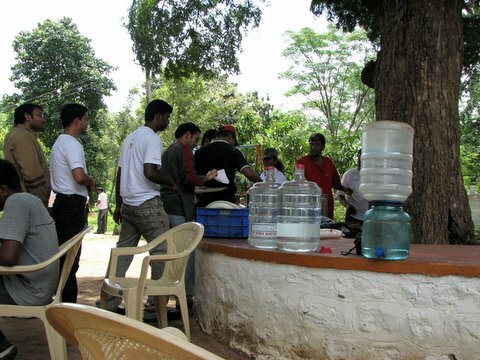 Last year the volunteers in Bangalore had taken some underprivileged children to a resort and spent the day with them. This year, they decided that through the NGO, Nisarga, they would work alongside Clean and Green to clean up the area around the Kaveri near Muthathi. Adarsh Raju, who has been with Oracle for just over a year now, has also always believed in voluntary work. Oracle has an annual Global Volunteer Days program, where employees the world over can sign on to do volunteer work; more committed members can also put up project proposals which will be vetted by a central group. Adarsh, and his friend Shashidhar and Rakesh, had put up three projects for this year: one was the plastic clean up at Muthathi, another a general clean up at the People for Animals shelter at Kengeri, and the third, a sapling-planting day at Bannerghatta Rehabilitation Centre. All three projects were approved by the central team. 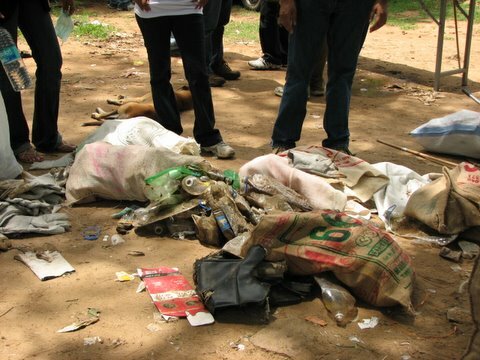 They were able to mobilize about 70 volunteers this time, and two buses took them all to the picnic area near the banks of the Kaveri at Muthathi, which is one of the worst areas for plastic garbage being thrown away. Sandeep explained that the plastic had to be segregated into the flollowing categories: a. plain plastic, b. PET bottles and other plastic bottles, c. composites like Kurkure packets which could not be recycled, and d. plastic cups and glasses. We worked for about two-and-a-half hours, after which the heat and the hard work ensured that enthusiasm started flagging. 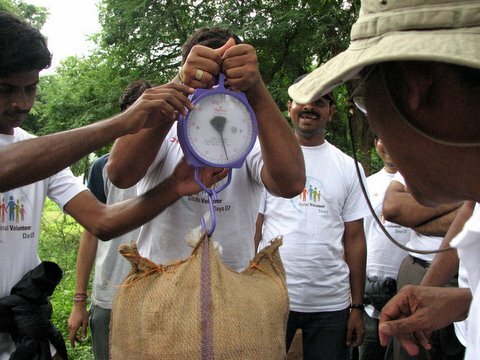 At this point, Sandeep called a halt, and all the collected trash was compacted into gunny sacks, with much energetic stomping and crushing on the part of the volunteers! In just two and a half hours, we had picked up….306 kg of plastic! So that will give you an idea of just how much plastic is choking that area…..! Everyone was taken to the Forest Guest House nearby, where the Asst Conservator of Forests, Mr M K Ravindra, left his busy schedule to come and meet the volunteers and extend an invitation to them to come over any time they wished. It was very good to see this kind of co-operation between the Forest Dept and the Oracle Global Days Volunteers. 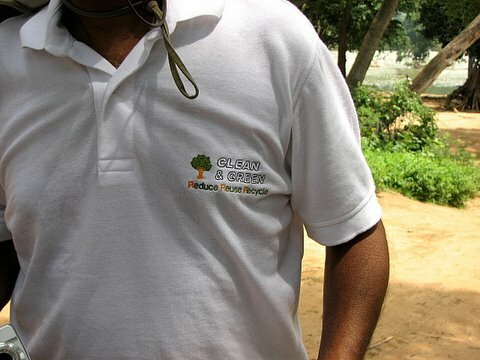 The Regional Forest Officer, Mr Kempuve Gowda, was also there, and several volunteers exchanged notes with him, too. While the cleanup drive was on, many of us also tried talking to the tourists and visitors there about the importance of not littering. One group, very hospitably, extended an invitation to us to share the chicken biryani which was being cooked right then! Apparently, at the last cleanup, several visitors also picked up rakes and started cleaning alongside the volunteers, too…a heartening sight. Such joint initiatives and actions surely serve to illustrate the saying that “it is better to light a candle than curse the darkness”. We wish both Clean and Green and Oracle more success with such projects in future! Hey Deepa! Great job! Both the clean-up and the write-up! This needs to be published in a newspaper! Bunch of people helping themselves in the name of volunteering. To be honest, I see these events as more of a PR excercise(for the company sponsoring it) and a photo shoot oppurtunity (Just look at the number of people having cameras) & an item to add in their appraisals for the people participating. Why the hell do people need a camera when they are there for cleaning up garbage? The people got their Free T Shirt and lunch and getaway from the routine job in office. The company got the news coverage it wanted. Even you could not shift your camera lens off the Company logo on the T Shirt. Now people would roam around proudly wearing those shirts arousing curiosity and spreading publicity. Ragpickers, & Pourakarmikas clean more garbage than this, every single day. One may argue that the places being talked about is not the city, but the forests and places where trekkers invade. Isn’t the same bunch(or the likes of it) responsible for the trashy condition of these places? Wouldn’t it be better if people would not throw garbage in the first place, than attempting to get some publicity in the name of cleaning it by putting on a T-Shirt provided by a Corporate and posing for a shot with Garbage bags in hand? Hi, I have NO doubt that ragpickers and pourakramikas do a good job of trash removal, but surely, the effort that ordinary citizens take towards doing this (when most of us just walk away with apathy) is a good thing? And if a corporate is willing to underwrite the effort, that’s not a bad thing either, I would call it a win-win situation. Yes, of course it would be a great thing if we could educate ourselves NOT to throw garbage in the first place, but it’s just not happening. And I think you are wrong in saying that it is these same people who are cleaning up who are throwing the garbage in the same place. I think this is the 13th cleanup drive by Clean and Green, and they haven’t sought any publicity at all. They just go and clean up. It so happened that this time Oracle joined hands with them, that’s all. And..nobody was “helping themselves”. All volunteers paid for the transport and usually they pay for their food as well. RAO : I wont even call u cynical..free t-shirt,free lunch..tats wat u think abt loser.. LOL!! where do u work..i mean do u get paid enuf to afford a t-shirt and lunch ? seems like a case of sour grapes and arm chair dysentry happening at the same time!!! Deepa: Its a great initiative..and thnx a lot for the coverage..and yes..it shud get lot of publicity..this is a noble cause and more the publicity the better. BTW you dont have to justify to losers like RAO !! Great Job. Do people like Rao really exist.?? Let’s clear the air a bit here. Mr Rao…I forgot to mention one point. I took my camera along because I *always* take my camera along…in fact, since it was close to the river and forest, I should have taken my wildlife camera along! Most youngsters today at least have a camera with their mobiles, so it’s not really any bad motive or publicity seeking. I was not thinking of writing about the cleanup until I realized what a good effort it was. The volunteers really worked hard….I have not done so much manual labour for years! And they were trying to make up for the others who had done the littering. Every person is entitled to his/her own opinion about things. Just because that opinion doesn’t coincide with ours doesn’t entitle us to call someone a “loser” or make personal remarks. Over the years, I have, indeed, seen socialites who pose for the camera more than they do real voluntary work, so some of the points that Mr Rao is making are quite valid. And where I disagree with him, I tell him so without descending to personalities. Attack the argument, not the person making it. And ROFL and Jeen….Mr Rao has stated his opinion, but has left his name, which neither of you have done. Your opinion is valid, but do tell us who you are. Is anyone with good organizational skills interested in turning this into a regular event? Probably as something to do every weekend, by volunteers, to go around and hike and clean in all the popular haunts around Bangalore. The effort will be in coordinating people and locations, and this can probably be done online. I think a larger effort, which includes educating the people who come to these places on the weekends, as well as a sustained campaign, is required to tackle this menace. Any thoughts? A lot of people, and a lot of companies will participate, if we do this more regularly. (I know there was an organization called trek2clean a while back, and this is really heartwarming to see Clean and Green take part in this effort).